First of all, check out this article for an overview of how custom event listeners work in Google Tag Manager. The reason I’m writing this #GTMTips article is that I want to upgrade the solution slightly, and I want to bring it back into the spotlight. Why? Because it’s still one of the most effective ways to customize your Google Tag Manager implementation. The idea is that when the page loads, you attach your custom listener to whatever element you want to track for the given event. Then, when this interaction is recorded by the browser, the code pushes an object into dataLayer which you can then use to populate your tags. This is what the Custom HTML tag would look like. // Leave useCapture to true if you want to avoid propagation issues. Fire this on a Page View trigger if attaching directly to the document node, or a DOM Ready trigger if attaching directly to an element and the element is in the HTML source, or a Window Loaded trigger if attaching directly to an element that is added dynamically to the page during the page load. Make sure you change the eventName value to reflect which event you want to track. If you want to track clicks, change it to click. If you want to track users hovering over the element, change it to mouseover, and so on. You can choose to add the listener directly to an element by using the appropriate CSS selector as the parameter of document.querySelector(). Alternatively, you can add the listener directly on the document node. Finally, you can set useCapture to false if you want to use the bubble phase instead of the capture phase with your event handler. Because you are simply tracking interactions and not actually creating any side effects, I really recommend leaving this as true. This callback pushes a bunch of information about the event into dataLayer, namespacing everything with the custom.gtm. prefix. The event name itself will be custom.event.<event name>, e.g. custom.event.click for a click event or custom.event.dragstart when tracking the dragging action. The variables pushed into dataLayer mirror those used by GTM’s default triggers, with the exception of custom.gtm.originalEvent which will contain a reference to the original event that invoked the callback. This is significant if you need information from this event object, such as which mouse button was clicked when a click is registered. This is (currently) missing from GTM’s default trigger functionality. Add a DOM Ready trigger to this tag, set to fire on pages which have this particular form in the HTML source. And you can pick these up with the Data Layer variables you created earlier. You’ll just need a Custom Event trigger, where the Event name field has the value custom.event.submit. Once you attach that trigger to your tag, you can use the Data Layer variables to populate all the relevant fields. Whenever I talk about GTM to someone, and that’s very often, I always end up talking about the many ways we can customize Google Tag Manager to work even more efficiently on our websites. Custom Event listeners are still, after all these years, my favorite way of customizing a GTM setup. They give you so much power in tracking user interactions on the site. As always, I hope GTM continues to release new default triggers for us. I’ve long dreamed of a “blank” event trigger, where you simply have to add the DOM event name, and it would also have a checkbox for whether you want to use capture mode or not. It would make this custom solution redundant, but that’s only a good thing in my book. 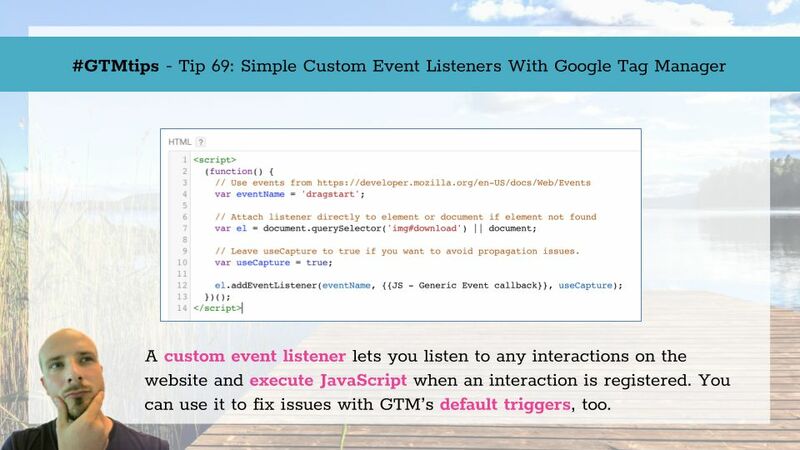 Have you created any creative custom event listeners in your GTM setups?